We returned from vacation and the first day back, I went right to the farm stand. I needed to see the State of the Produce. I knew the weather had been really hot and dry. As expected, the chiles were just starting to arrive. The jalapenos were huge and plump. And equally expected, the tomatoes were just gorgeous. A little panic set in. I started measuring off the weeks of tomato season, and all the foods I like to can – salsa, tomato jam, tomato sauce, crushed tomatoes, tomato soup, tomato juice – and those I freeze – oven roasted tomatoes by the sheet pan full. I craved a tomato sandwich. A BLT. A BLaT (avocado.) I fretted. I calculated the pounds of tomatoes that would pass through my kitchen. I got started with fifty pounds. Two boxes. One box was filled with plump, ripe and smallish tomatoes, not heirloom, nothing fancy, except they looked good to me. Time to get tomato vegetable juice, tomato jam, and roasted tomato soup into jars. The other 25 pounds were basic Romas. Those would be oven roasted, made into sauce, and paste. Two long days later, here’s my bounty. First, for you newcomers to tomato canning, jump right in. 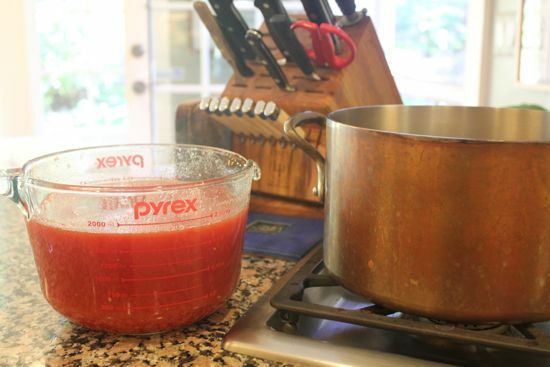 There are many ways to preserve tomatoes with only a boiling water canner. 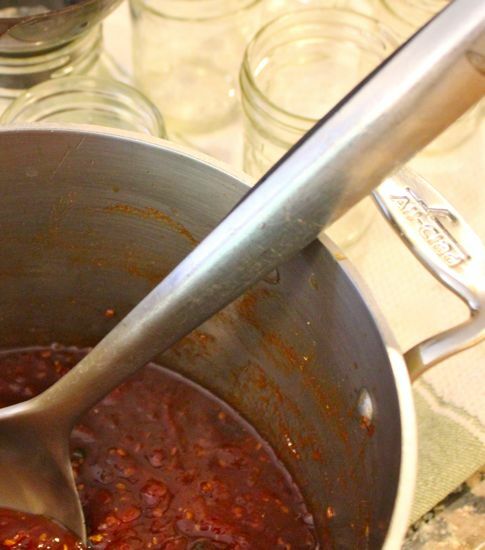 For you experienced canners, isn’t it time you considered a pressure canner? Tomatoes from the sunny months of summer sealed up in a jar – you’ll be so happy! It’s life changing to taste your very own canned tomatoes. Lower in salt. Even no salt. No additives. No BPA. It’s hot, it’s hard work, it’s really a wonderful kind of miserable, so get your family and friends to help. Chill the beer and wine, crank up the music, put out some snacks, share the work, and divvy up the end products. So, so worth it. Safety is an issue with tomato products. When a recipe calls for RealLemon Juice, you must use the weird lemon juice that comes in a green bottle. It’s the only way to assure your added acidity is consistent (unless you want to do Ph testing.) Acid levels keep the canned tomatoes safe on the shelf. Whole tomatoes, crushed tomatoes, juice. and/or tomato sauce (not a sauce w/ additives, but cooked down tomatoes, seeds and skins removed, pureed) tomato jams and chutneys, tomato pickles may all be processed in a boiling water bath. Any time you add fats (meats, olive oil, chicken stock) or tinker with acidity levels (carrots, celery, peppers, onions) or add garlic, check with known sources like the Ball Blue Book of Preserving or the National Center for Home Food Preservation, but as a rule of thumb, you will need to use a pressure canner. Or freeze. A pressure canner brings the contents of the jar to temperatures of 241° – which is where botulism dies. 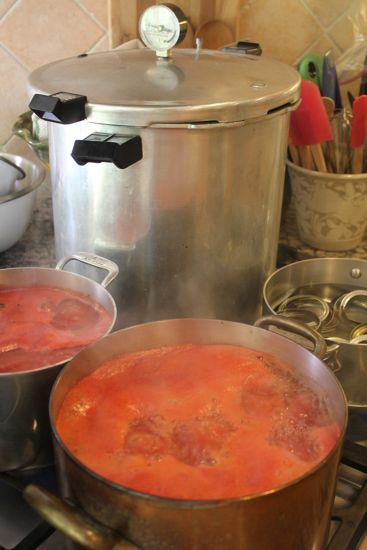 A pressure canner also works faster, which is incredibly useful when you have many pounds of tomatoes to process. This is the pressure canner I use. It’s been my trusty companion for years. Nevertheless, every year, I reread the instruction booklet. It’s not complicated, but I want to make sure I get it right. Tomato Vegetable Juice. Bloody Mary in a Jar. I’ll let you in on a little secret. I hate bell peppers. So for this, and virtually any recipe that requires peppers, I either leave them out, or I buy sweet Italian peppers. My favorite is Jimmy Nardello, which hovers somewhere over in the sweet chile side – not bell-ish at all. My version of the juice is pretty eye-opening, I add two jalapenos with all the seeds. Start with a little bit of heat, and bump it up according to your own taste. 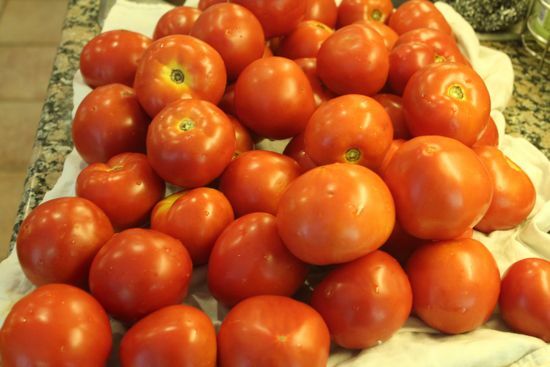 7 quarts fresh tomatoes – about 10-12 lbs. When you have two quarts of tomatoes in the pot, crush them a little with a potato masher. This little step will keep your juice from separating in the jar. Continue to chop and add the tomatoes until you have all seven quarts in the pot. 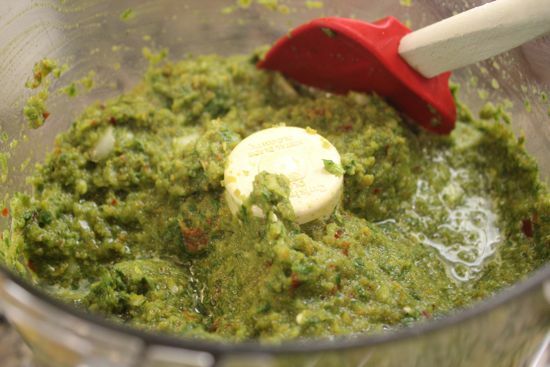 Allow them to cook while you puree/liquify all the other vegetables in the food processor. Add the pureed vegetables and the celery seed to the tomatoes. Simmer the juice, covered. After about 15 minutes, taste and correct for spiciness (you will be adding lemon, sugar and salt later, so you’re just checking for heat here.) Continue cooking for 30 more minutes. 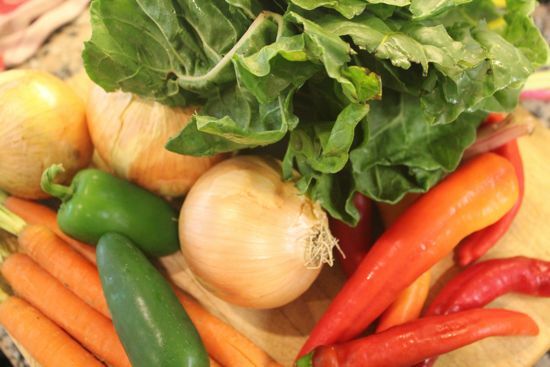 Carefully put the vegetables and juice through the smallest disk of a food mill, then return the juice to the pot and bring it back up to a simmer. 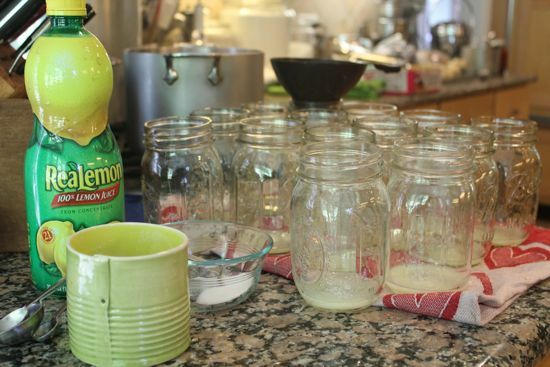 To each sterilized pint jar add 1 Tbls lemon juice, 1/2 tsp salt and 1/2 tsp sugar. Ladle hot juice into the jars. Seal jars and process 35 minutes in a boiling water canner. Wash and rough chop the tomatoes. Do not worry about coring or deseeding. 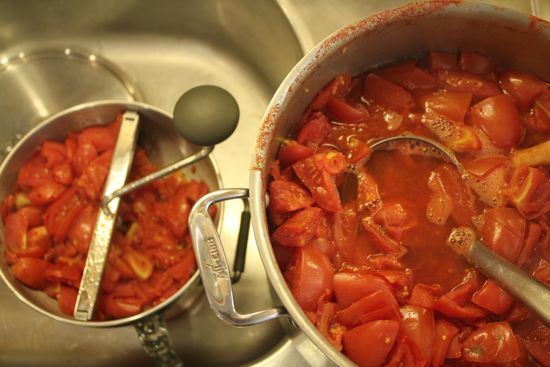 As the tomatoes are chopped, add them to a very large (10 – 12 quart) non-reactive stockpot. When you have 8 cups of tomatoes in the pan, turn on the heat and smash the tomatoes with a potato masher. Allow them to come to a simmer while you cut up the rest of the tomatoes. Stir in the tomatoes as you chop them. When they have all been added, bring the mixture up to a boil. Reduce and simmer 30 minutes, covered. 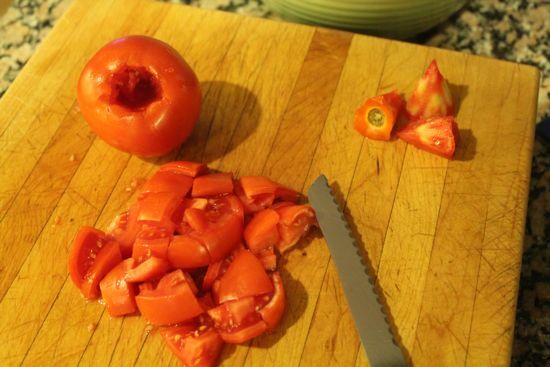 Put the tomatoes through a food mill to remove skins and seeds. Put the sauce back into the stockpot and reduce until the sauce is the consistency you like best. About the consistency – I prefer to can a thin sauce, as I frequently add it to soups and stews. If I want a thicker sauce, I just reduce it when I open the jar. This sauce makes a great pizza sauce after significant reduction. Add 1 Tablespoon of Lemon Juice and 1/2 teaspoon of salt, if desired, into each pint jar. This recipe is very close to one I saw in the New York Times by Mark Bittman. I’ve tinkered with the sugars and acidity to ensure it was safe for canning. I had never considered jamming with ripe tomatoes – only green, for chutney and pickles. But ripe? Yes! It was a revelation. Totally delicious with scrambled eggs, in a grilled cheese sandwich, alongside a simple grilled or roasted chicken. It makes a beautiful glistening sweet, spicy, unexpected treat. Pack this jam in quarter-pint (small) jars – it’s a perfect hostess gift or picnic fare, with a hunk of fresh goat cheese and a baguette. Add salad, and I call that dinner on these hot summer nights. Wash, core and dice the tomatoes. After you have about half the tomatoes chopped, put them in a non-reactive 5 quart stockpot and crush them a little with a potato masher or wooden spoon. Just get the juices flowing. Turn the heat to medium, add the two sugars, and start to cook the jam. Add the remaining tomatoes and the rest of the ingredients and bring it to a good rolling boil, stirring often. Reduce heat and simmer until the texture is thick and silky, about two hours. For the safest practices, and best basic processing information, there is no better site than the National Center for Home Food Preservation. This year I’ve doing more “freezer” processing to remove skins and much of the moisture rather than heating up the house so much. I so prefer that method. Only challenge is finding the freezer space. Great yet more ways to use tomatoes!!! I was given over 20 pounds of mostly baby Romas on Saturday and still have some left. I have used 20 pounds so far which is how I know it was over 20 pounds. I will have to try oven drying some that I pick up on Saturday in Hanover. And I will wait until I take your class before I think of pressure canning. And I will be bringing you a sample or three to the class at the Kitchen Studio. Including my chili-tomato jam. And if I get it done, my variation on one of your recipes. Can’t wait to meet you, Mia! Okay question about the lemon juice. Can I use citric acid instead? I have citric acid powder and have read that I can use that instead of the lemon juice. I have a few pints of tomatoes to do tomorrow. The rule is 1/2 teaspoon of citric acid per quart of tomatoes. So if I am doing pints, I would use 1/4 of a teaspoon. Thank you! Thank you DDF, yes, citric acid is a fine substitute, but harder to locate. Yes, use 1/2 teaspoon citric acid for every quart. Just add it to the filled jar before capping. I recently had a windfall of 30# of gorgeous romas, and put up puree, crushed tomatoes, and roasted tomatoes in oil. This post makes me eager for more, more more! And on an unrelated note, I am eating my way through a jar of apricot preserves I made using your recipe, and it is bringing me so much happiness. In fact, now that I’ve mentioned it, I think I’m going to have to go and eat some right now. I am a total convert to that method, and can’t wait to try it on more fruits! Puree – much better word for it than “sauce” as in my post. The puree is a great addition to my pantry, especially as Dennis doesn’t always love the chunks of tomato in soups, etc. but I want the flavor. I have put up honest-to-goodness cooked-down and somewhat seasoned sauce, but I have found it somewhat disappointing–I much prefer a sauce with more veggies in it when it comes to eating, it takes so long to cook, and then the yield is so puny. Putting up puree is so quick in comparison!! 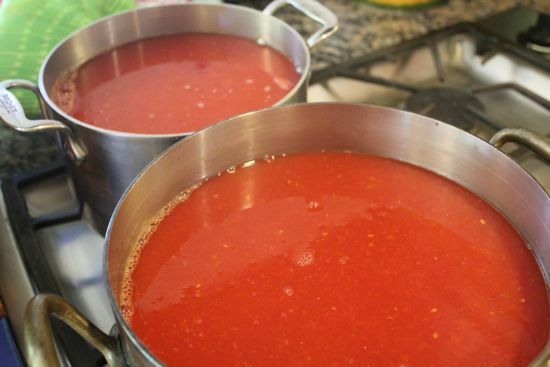 Though I recently saw a recipe for roasted tomato pizza sauce that I may need to can a big batch of…. I make what I call a passata, but I guess it isn’t because passatas are, I believe, made from uncooked tomatoes that are turned into a kind of paste. The important aspect is the intensity of flavor. I achieve that intensity of flavor by a different method, and end up with an “almost-paste” that I can. My big tomato harvesting season is usually just before the first killer frost (I’m just beginning to get ripe tomatoes now). After picking many tomatoes, boxes of them if it’s a good year, I lightly oil a casserole dish (often several), then rinse the tomatoes, cut off any bad spots, and take out the stem end. I salt them well then roast them at 325F until they’re well-carmelized and the liquid is reduced by half. I usually do this before bed, then let them cool in the oven all night. In the morning, I throw them into the food processor, grind until smooth, then put the mix in wide-mouth, 1/2pt. canning jars, add the appropriate amount of ReaLemon (1/2 tsp. ), and finish them in a boiling water bath. At the end of the season, I also have many green tomatoes that I bring in to ripen in my sun room. I usually have enough to do the same canning process several more times, into November. I use the roasted tomato mix for sauces and braises, and it’s often sweet enough to make tomato crostini. And it’s so easy to do! Love this idea. I’m going to give it a try with the next 25# box. I originally came up with the idea because my freezer was too full for bags of tomatoes, I was too busy teaching, and I had a record year for tomatoes! After tasting how good and versatile this method is, it became a must-do project every year! I hope you enjoy it! Could you give me an idea of pounds to pints ratio? I process the bulk of my tomatoes in a similar way, a condensed conserva, but at a lower temperature in large hotel pans for maximum surface area. I like bold flavors. I’m not a big fan of watery canned tomatoes in any form. I love the part about the hot, sweaty work but how it’s still fun. Takes me back many years to a huge garden and a girlfriend I still keep in touch with. We would spend a couple of days managing the bounty of our tomato crop and it was a lot of hard work but we did it together (with four little kids between us) and I remember nothing but a lot of spatters, star sandwiches for the kids for lunch and a lot of laughter between us. Oh…and shelves of tomatoes to use during the winter. Right now I really am missing Jan, but in a very good way. This is not the first time I’ve wished we lived closer, Barb! Bourbon – what a great idea! Me too Cathy. I suppose I could come to DC at the right time of the year and we could recreate it. You have the dog and well, I’m thinking your sweet husband could handle a couple of star shaped sandwiches! Wendy would have to come too, of course…she said the magic word. Booze. I am thinking about these oven roasted tomatoes frozen in oil. How long do roast them for and how much oil do you typically put them in to freeze? Hi Liz, Here’s what I do. 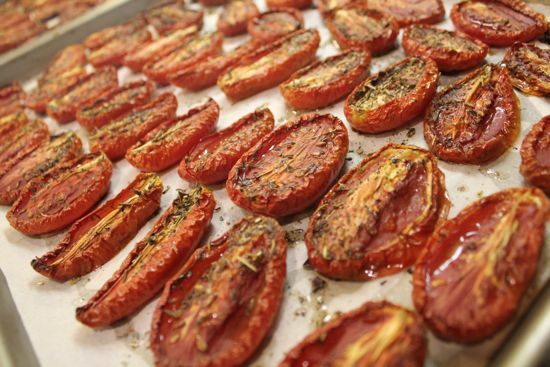 Slice tomatoes lengthwise, place cut side up on a sheet pan lined in parchment. Sprinkle olive oil, salt, pepper and (my favorite) Herbes de Provence all over all the halves, then slow cook in a 250° oven for about two to three hours. Store in zip bags with the oil they were cooked in. nice. Thanks a lot! Now I just need to find some less juicy tomatoes as I seem to be stuck with lots of heirloom regular variety and not so many good roasters! Today I found the half-bushels of seconds at the local farmstand and all but started jumping up and down. 🙂 I’m so excited…last summer I discovered tomato juice by accident, as a by-product of canning the diced tomatoes. I filled the jars with the solids and then ladled juice in up to the tops, but I had tons of juice left over afterwards…so I canned a couple of quarts of it, and then just chilled the last couple of pints..DIVINE. Unseasoned, untreated, just plain old tomato juice, and it was just delicious. Did you see Linda Ziedrich’s post on using real lemons instead of ReaLemon? I canned 25 quarts of tomato’s this weekend and 5 quarts did not seal, what would you do with them? Try sealing again or use immediately? Hi Dawn, I hate seal failure! Makes me so annoyed. Within 24 hours, you can reprocess what’s in the jars. That means a fresh lid – I often get a fresh jar, too. Miniscule cracks or bits of food along the top rim can interfere with the seal. Remember to wipe off the top of your jars really well. If reprocessing seems like a pain in the neck, just pop the jar in the fridge and use it within a month. Hi Cathy! I just made some of your spicy tomato jam. Once I had everything in the pot, I realized I had used 4 lbs of tomatoes instead of 3.5, so I was rapidly recalculating how much sugar and lime juice I needed to add to adjust for that. Hopefully I will not kill anyone with poor calculations. Anyway, I also cooked my jam down for more than two hours because it didn’t seem think enough to me. By the end it was sort of a dark reddish brown color. Is that normal? And, now that it’s in jars, do I have to wait a while before I eat one or are they ready to go right away? (I know with your dilly beans, you say to wait a week before you open…) Thanks! I went to your class at Strosniders this summer, and hope to come to another class this fall! Hi Molly, so glad you tried the jam. The acid/sugar/tomato ratios are important for the tomato jam, but increasing the sugar and lime should be fine. The color of the jam is a rather dark ruddy red, not bright. I played with white vinegar and that retained the color but I didn’t like the flavor as well. Thanks Cathy! I opened a jar last night and served with goat cheese and long flatbread crackers. Delicious! Hi Cathy! Thanks so much for the classes. We’re working through tomatoes this weekend while waiting for the storm (hopefully no power issues this weekend). Anyway, we are hoping to make some tomato paste, but we can’t seem to find a recipe on your site or Food52. Hoping you could point us in the right direction :-). Thanks again! Oh…I see now…didn’t scroll down far enough on the search results (feeling foolish). Thanks so much!!! I had to go on a business trip right when my tomatoes started coming in, so I froze them. It has been a week. Is it okay to defrost them, remove the skins and then process them as crushed tomatoes using your recipe? Also, for the 15 tomatoes I picked last night, can I remove the skins on those, crush them, refrigerate them and then can them this weekend? Sure! When you defrost your tomatoes, the skins will come right off! Don’t forget to core them, too (that’s messy) and then go ahead and can. For the 15 you picked last night, why not just throw them in the freezer, too? Once you peel, chop and heat the tomatoes for five minutes (boiling) you can refrigerate and then bring back to a boil for five minutes before you put them in the jars to can. Hope that answers your question! Great idea. I’m washing and freezing right now! Who knew this could be so easy? We are going through the awesome spicy tomato jam like wildfire! I’m new to canning and fear straying from directions, can I double this recipe and put it up in 8 oz. jars and still just do the bath for 10 minutes or would it require more time? I just made your juice today-my first canning project! My mother made a juice like this and I’ve always wanted to try too. Was so glad to see your recipe! My juice is kinda “brown”. I used green peppers and chard. Maybe next time I’ll use red. Would it be ok to leave out the chard or spinach altogether? Still tastes yummy! thanks! Yes, the color can be affected by green peppers – better to use red or yellow or orange. As for the spinach/chard? You can add it or not – entirely up to you. I’m just trying to get a lot of veggies in every glass. OK…I’m fascinated with the tomato jam. Last year, you inspired me to try tomato paste so this year, I venture further! you are a god! this is amazing!why have i never thought of bloody mary mix! thank you for this idea too! The tomato jam sounds interesting. Question though – is there a particular reason you steer away from heirloom tomatoes in that recipe? I find heirlooms to be inconsistent when it comes to wateriness and tartness so prefer to use brandywine or any of the other big red orbs at the market. 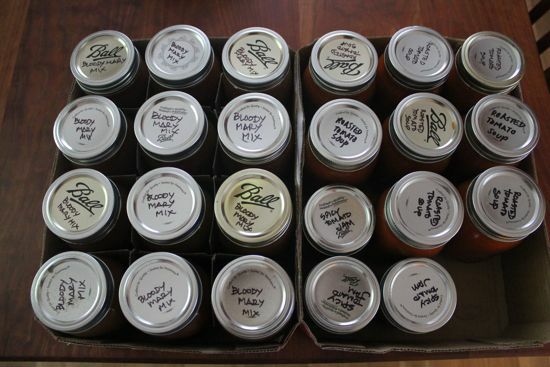 Hi Cathy – Last year was the first time that I canned tomatoes. I have a partial bottle of lemon juice left over from that. Is it ok to use this year or should I get a new one? I’m pretty sure that stuff never goes bad, but check the expiration date! Thanks. I use real lemons for cooking so the bottle has lasted…. She mentioned that you didn’t think it was a good idea to can it. Does that mean no pressure canning either, or just steam? I haven’t tried pressure canning yet, but I’m willing to try for this recipe! I spoke with another gal who thought that because it is pureed I could steam can it if I lower the Ph with some lemon juice or possibly red wine vinegar. I do have a ph tester and I was planning on testing my next batch to see where I was at naturally. I really love the ease and flavor of this recipe and I’ve frozen tons over last few years, but I’d love to be able to can it give it away too. Any suggestions? Cathy, help! I made one of your recipes for tomato juice on Aug 3rd. It’s now 4 days later and I found this blog and some of the info is different here from how I canned the juice. Now I am worried that I didn’t make the juice where it will last and be safe to drink. I used the recipe ” Garden in a Glass: Spice Tomato-Vegetable Juice” from your book Mrs. Wheelbarrow’s Practical Pantry . 2 questions for you: 1) is a 3/4″ head space safe for this recipe? The head space is not mentioned in the recipe in the book so I looked at the other tomato recipes in there and it ranged from 1/2″ to 1″. I decided to split the difference and used 3/4″. The jars did seal correctly and are nice and tightly sealed. 2) Is my juice safe to drink since I didn’t use bottled lemon juice? I used USA organic fresh lemons (not sure what type) for the 2 T lemon juice for each pint jar. The recipe in the book didn’t specify bottled lemon juice so I am hoping my jars are ok. If not is it still ok to re-can with new lids them adding citric acid or bottled lemon juice, or has it been too long since 4 days have already gone by? Laurie, I just found this comment – one year later. So sorry. I have come to understand the value of authentic lemon juice, not the processed stuff in the plastic bottle. Also, citric acid, which is a suitable, easy, inexpensive alternative. The recipe in my book is the most recent, the most up to date. Can you tell me the ballpark conversion of 25 pounds of tomatoes into the capacity size of sauce. So 25 lbs = ?quarts is my question. I did not weigh my tomatoes and I don’t know how much sauce I should use for the recipe. I know – that is stupid. I was concentrating on how my grinder went together and experimenting with it that I forgot that important step. Too much cinnamon, too much allspice. I did get exactly seven quarter-pint jars. Thanks – I’ll let you know how it goes over with other folks.